Headquartered in Seattle, Washington, Un-Cruise Adventures offers an alternative to traditional cruises by taking guests into areas inaccessible to large ships and on excursions that are exclusive, private, and unavailable to most other travelers. Un-Cruise Adventures has its roots in past Alaskan cruise companies such as American Safari Cruises, InnerSea Discoveries, and Cruise West. Inner Sea Discoveries was created when it purchased the bankrupt Alaskan cruise line, Cruise West in 2010. 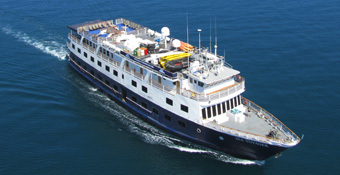 Then, in 2011, Inner Sea Discoveries became the parent company of another Alaska cruising company, American Safari Cruises. In January 2013 Inner Sea Discoveries changed its name to Un-Cruise Adventures. Today they operate a fleet of eight vessels that offer itineraries that include Alaska, Columbia and Snake Rivers, Hawaiian Islands and Mexico’s Sea of Cortez. Crew members are hired to work seasonal agreements. Work rotations of approximately 6 weeks on / 2 weeks off is their standard, yet may change. Everyone works varying shifts which could be as much as 12 hours in a single day. To apply, visit the Un-Cruise Adventures employment pages links and complete their online application form.